You will no doubt be aware of the PMQ yesterday, 11th June, by Duncan Hames, until recently PPS to the Deputy Prime Minister, in which Mr.Hames asked for the Prime Minister’s support for such an Inquiry but Mr. Cameron felt that the Home Office had the situation under control and no further measure was required. Thank you for your letter received today, by post on Wednesday 9th July 2014. You state that you did not receive my letter via email. I simply do not believe you. I have proof it was delivered. Your reply to me is extremely rude, condescending and smacks of the arrogancy of a figure of the ruling classes that pays lip service to the electorate. Let’s break down your reply. 1. I do not have a blog. 3. Why did the Banbury Guardian contact you to discuss an email you never received. 4. 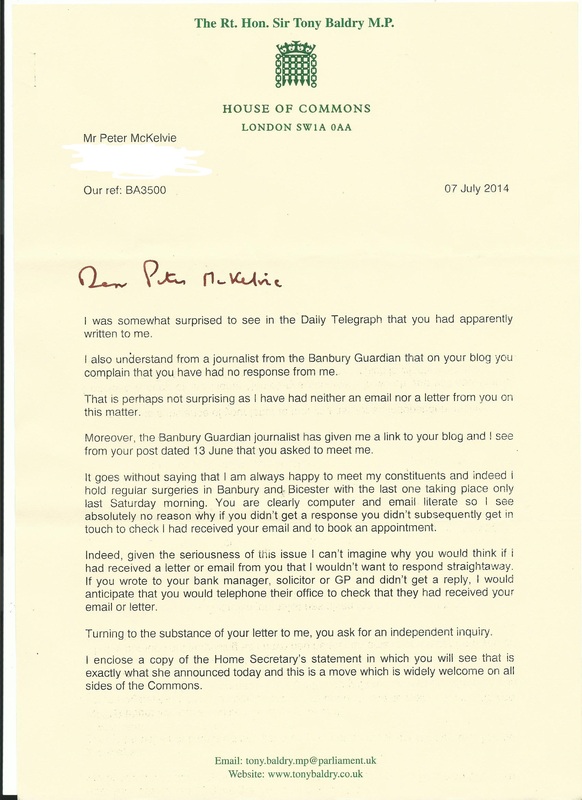 I note that you have taken the trouble to look at ” my blog ” ( I do not and never have had a blog ) on at least one occasion, but couldn’t reply to me until the 7th July, a significant date when you could sit back and think that your party had agreed entirely of it’s own volition to agree to a form of Independent Inquiry, and like the vast majority of your party’s MP’s could trot out the standard response. 5. ” You are clearly computer and email literate “. My family, friends and colleagues would find that very amusing. I am of the generation, and a Luddite to boot, where IT skills have passed me by and am almost a one finger typist who wouldn’t know what an app was if it hit me in the face. 6. You state ” why if you didn’t get a response you didn’t subsequently get in touch to check I had received your email”. I am actually computer literate enough to know if I send an email to the correct address and it isn’t returned undelivered with a failure message then I know it’s been received. 7. ” Indeed, given the seriousness of this issue I can’t imagine why you would think if I had received a letter or email from you that I wouldn’t want to respond straightaway “. I assumed and I believe it to be the case with you, that you were one of the large majority of MP’s who failed to answer constituents letters re. the specific issues I raised with you, and were stalling and refusing to recognise the unprecedented surge of people power and anger until your leadership could instruct you on the party line, which in your case came remarkably on the very day that you decided to reply to me ie 7th July, when your hitherto resistant Government were forced in to a humiliating climbdown to agree to a shadow of the type of Inquiry that Survivors of child sexual abuse have been long demanding. You enclose the Home Office Oral Statement Monday 7th July 2014 Child Abuse. I received a personal copy within an hour of it being released. 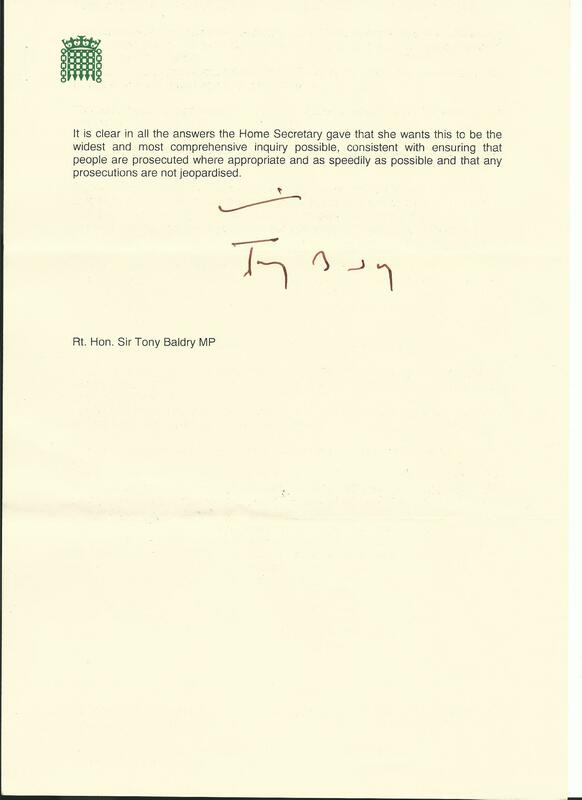 Your reply to someone who has campaigned for justice for survivors of child sexual abuse for over 30 years is as demeaning, insulting and condescending as the replies I have received for nearly 2 years from Mr. Cameron and the Home Office and shows the same level of disdain for a mere member of the public like myself as Mr. Norman Baker showed to me and a recognised child protection expert in a sham meeting with him earlier this year. She then goes on to portray anyone none too keen Butler Schlosspot as some misery monger who has no idea that BS is the godsend we’ve been waiting for.. Proper professional investigators instead of amateur ones …did he mean the cover up cops?? CLEAN HANDS NOT SAFE HANDS.